Originally the Lhasa Apso enthusiasts were part of the Tibetan Breeds Association, until at a meeting the Chair Person namely the Hon. 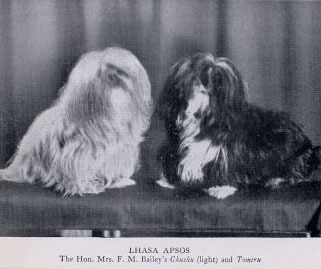 Mrs Irma Bailey asked the Committee if they were in favour of setting up a Lhasa Apso Club. The Committee unanimously agreed to this proposal. So it was, the club was formed in 1956 and became known as “The Tibetan Apso Club “. It was felt at the time that many people did not recognise the word “Lhasa” as having any connection with Tibet. In 1968, it was proposed by Mrs F Sefton that the club change it’s name to Lhasa Apso or Tibetan (Lhasa) Apso. Permission was granted by the Kennel Club and on January 1st 1970 the club was renamed “Lhasa Apso Club” and is recognised as the Parent club today. The first club Open show was held on 29th March 1969 at Oxford.with an entry of 91 Apsos and 97 entries. The judge was Monsieur Andre` Cle`ment-Cuny. from France. The first Championship Club Show took place at Wolverhampton on 28th November 1970. The judge was Mrs Judy de Casembroot who had an entry of 71 Apsos. The club continues to enrol new members both from England and Overseas. The Lhasa Apso Club holds one Championship show in October each year, currently at Stoneleigh Park. It also holds two Open shows, in January and July. A Summer and Winter Newsletter and Year Book are produced each year and sent to members, along with any news and announcements of judging and educational seminars, both for prospective novice and experienced judges and also for general breed awareness (subjects might include health issues, grooming and general care).